Considering a Termite Inspection for your Home in Orange County? If you are considering an Orange County Termite Inspection for your home or Condo, there are a few things to consider! If you are searching for Orange County Termite Inspection, then you will want to consider what type of inspection is done as well as the cost. 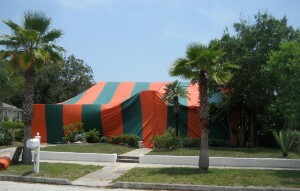 Now, if you have possible termite damage, you may use a local treatment process but also a full blown tenting process may be required. The best way to get rid of these termites is simply to use an exterminator. You hear sometimes of some type of DIY (Do it Yourself) treatment. Don’t be fooled. Traps, baits, i.e., bait stations will not kill them to any level you need and may actually spread them further! (Contact us to learn why). Now, you may have actually seen the termite poop, as it looks like a mound of eaten wood pellets. Now, there are various types of extermination treatments such as Orange Oil, Fumidor chemicals, Tenting, etc.. Which one is for you to kill those flying winged termites? How long will you have to stay out of the home/premises while the treatment is being completed. Review of the Termite inspection report! WE explain in detail! How will the termites be detected, i.e., will the exterminator crawl throughout the crawl space of the home or simply checking the outside rafters. We do.. we like to get down and dirty! 😉 That is the only way to get to the root of the infestation. Now, its a fact that the destruction of real estate properties is in the billions per year! These termites are truly disastrous for your home and if your exterminator states your property needs to be tented, then you will need to be ready to leave the premises for a few days! The good new is that this is the only 100% method of getting rid of termites. Some interesting facts about termites found in Orange County? Well, If you live on the coast like in Huntington Beach, San Clemente or maybe in Mission Viejo, etc.. you will know that termite infestation is rampant. We look forward to assisting you make that wise decision on getting rid of termites by the “correct” treatment. We will go over the difference between subterranean termites, drywood termites, and the best termite treatment methods. Ready? We are! Please call us or simply fill out the form below. We will send you information in the meantime and schedule a call to go out to do one of our free inspections. Thank you and we look forward to making your place bug free!